"Who knew that 'in home fibre' meant THROUGH MY DRAINAGE PIPE?" A New Brunswick woman shared this photo on Twitter and Reddit on Friday. The excitement of a new high-speed internet connection washed out quickly for a Moncton, N.B. woman after a Bell technician bungled the installation. A Twitter user named Nikki said she had just moved into a new house on Wednesday and had a fibre optic cable for internet access installed on Friday. She said she was initially excited to have internet access in the new place. But later that day, she could tell something was wrong. She had gone downstairs just after washing dishes and was surprised to find water all over her ledge, she said Friday. She called a plumber, who tracked the source of the leak to one segment of the wall. When the wall was cut open, they found that the fibre optic cable had been installed directly through a drainage pipe. Because Monday is a statutory holiday in New Brunswick, she explained Bell's customer service informed her that she wouldn't hear back from the company until Tuesday. She shared her experience on Reddit, where it went viral. 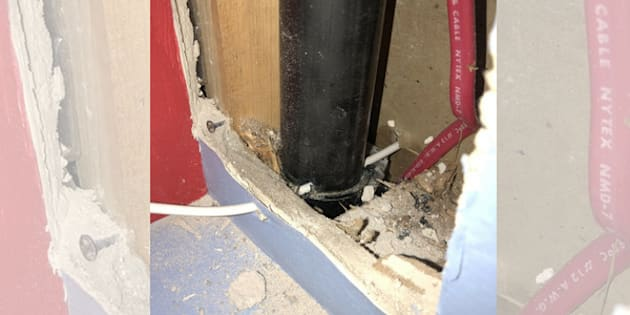 Other users shared their own plumbing horror stories. As for Nikki, she was able to get a plumber on short notice who could fix the pipe, and posted a photo of her new, leak-free drainage pipe to Reddit. She updated her post to explain that someone from a local Bell affiliate had gotten in touch with her to send over another technician. Someone will be sent to replace the drywall after the long weekend, which she said was damaged on both sides due to exposure to moisture. UPDATE: someone from Bell contacted us because the post went viral on reddit. I feel bad for someone who isn't internet savvy and has this done to them and have to wait a week for results.